News subscription required to download the report. Please sign in if you wish to continue. South Korean manufacturers currently have more than 95% of the AMOLED market, but panel makers in China, Taiwan and Japan will still compete in these sectors. This report analyzes the current state of development and strategies of the two largest AMOLED panel makers, Samsung and LG Display, examines the potential of the AMOLED handset panel and OLED TV markets, and takes an in-depth look at the competitiveness of South Korea in the AMOLED sector and the reasons behind it, including brand strength and supply chain integration. The thin, light structure and high image quality of AMOLED panels has led many to regard them as the display technology of the future. South Korean manufacturers currently have more than 95% of the large and small/medium AMOLED panel markets, but display panel manufacturers in China, Taiwan and Japan have by no means abandoned their efforts to compete in these sectors. This report analyzes the current state of development and strategies of the two largest AMOLED panel makers, Samsung Electronics and LG Display, examines the potential of the AMOLED handset panel and OLED TV markets, and takes an in-depth look at the competitiveness of South Korea in the AMOLED sector and the reasons behind it, including brand strength and supply chain integration. 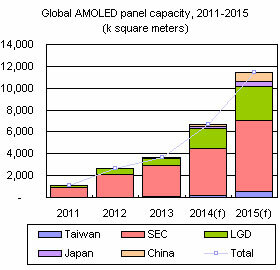 The AMOLED market still faces a number of challenges, particularly from full HD and higher resolution small LCD panels and UHD LED TV panels, threats which could push back AMOLED's adoption as the next generation of mainstream display technology. 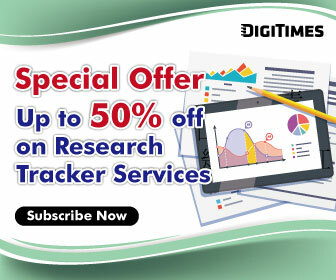 In addition, Digitimes Research analyzes the potential future positions and opportunities for panel manufacturers in China, Taiwan and Japan in the AMOLED market.